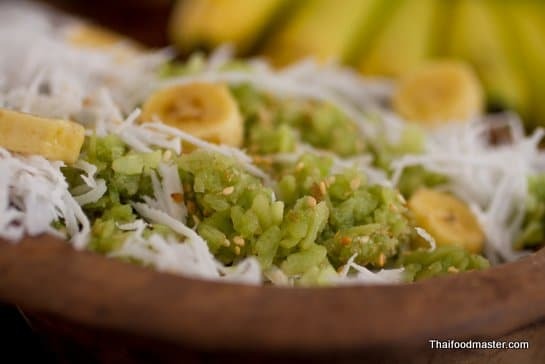 Roasted Pounded Unripe Rice Grains Served with Shrimp Relish and Grated Coconut. 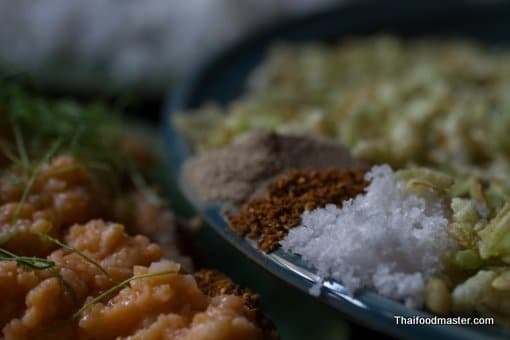 Khao mao bueang and khao Mao Mee (ข้าวเม่าหมี่) are the only two known savory dishes from antiquity made from pounded unripe rice grains (ข้าวเม่า; khao mao). While khao mao mee (ข้าวเม่าหมี่) is still a well-known and widely available dish, very few people remember khao mao bueang. Therefore, we are pleased to reintroduce into the Thai culinary repertoire the delicious khao mao bueang. 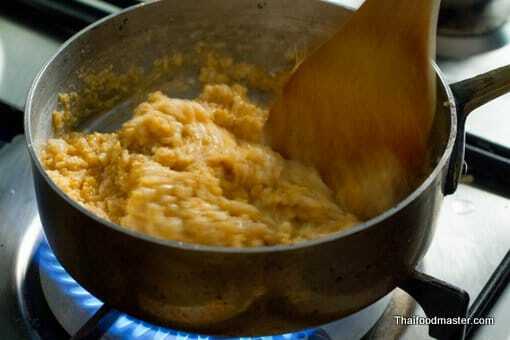 This recipe for khao mao bueang is adapted from Thanpuying (Lady) Plean Passakornrawong. 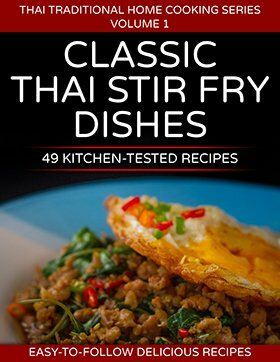 She was a pioneer of noble Thai cuisine, who lived and worked during the reign of King Rama V and the beginning of the reign of King Rama VI. A khao mao bueang meal consists of three separate plates. Each diner takes a small portion from each plate and mixes them, customizing the taste and textures to one’s liking. It needs to be eaten immediately, when its crunchiness and flavor are at their peak. Each guest will begin by taking freshly roasted unripe rice grains, then combining the grains with an intense shrimp relish, semi-mature grated and steamed coconut, and a fine chiffonade of kaffir lime leaves and torn coriander leaves, further adjusting the seasoning with salt, ground white peppercorns and ground chili peppers. Seasoned only with salt and sugar to enhance their natural sweetness, the richness of the shrimp and coconut matches beautifully with the crunchiness and fragrance of the unripe rice grains. The ancient Thai word beuuang (เบื้อง) has two meanings: it refers to the earthenware used for wall and tile coverings; as well as to “a rounded and flattened earthenware griddle with an insulated handle”. 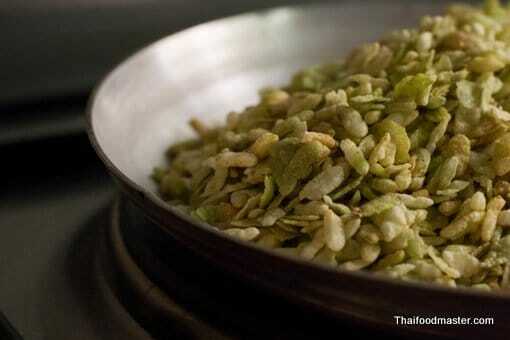 This item is used for making snacks, crepes or khao mao (pounded unripe rice grains). A well-known Thai crepe-like dessert made in this earthenware griddle is called khanohm beuuang (ขนมเบื้อง). The history of this dish can be tracked back from the Ayutthaya era and is still very popular in present-day Thailand. Khanohm beuuang evolved from both folk and aristocratic culinary traditions. 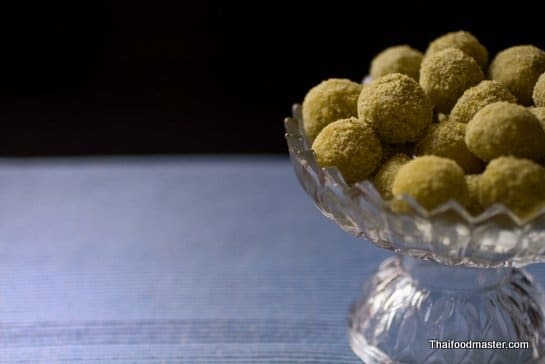 In the common version, a rice flour similar to the type used for khanohm krok (ขนมครก), a Thai-style sweet muffin-like dish, was used. But the resulting khanohm beuuang crepe had a savory and rich flavor, and was eaten with sugar to add sweetness. 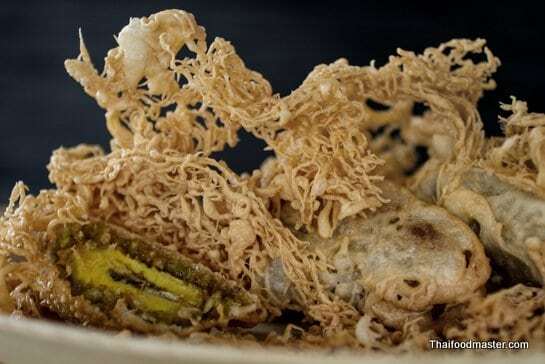 The other version of the khanohm beuuang crepe was offered in the homes of upper-class and elite families and is called khanohm beuuang chao wang (Royal Thai Sweet Crepe). 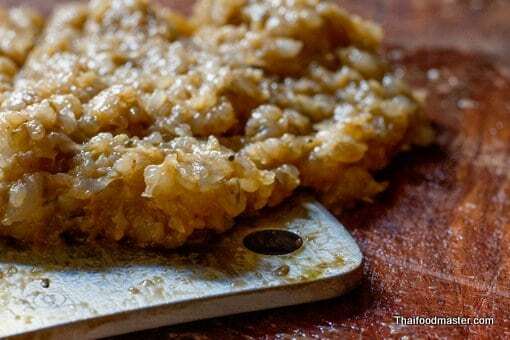 This royal crepe recipe calls for mung bean flour to be combined with the rice flour, spread thinly on the griddle, and then filled with various toppings. Both sweet and salty toppings were used to complement the crepe’s delicate taste. 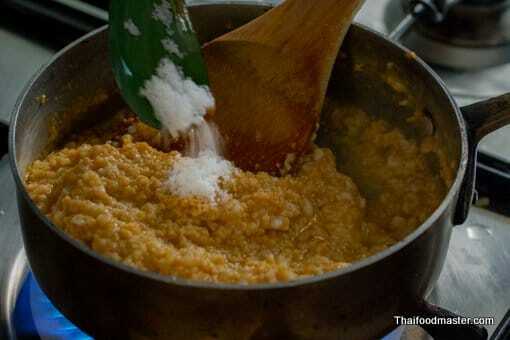 Savory toppings were composed of pounded shrimp meat mixed with shredded coconut. It was seasoned with garlic, white pepper, salt and sugar, and lifted with finely-chopped coriander and kaffir lime leaves. The artful preparation of khanohm beuuang crepe is considered by many to be a highly-skilled performance. 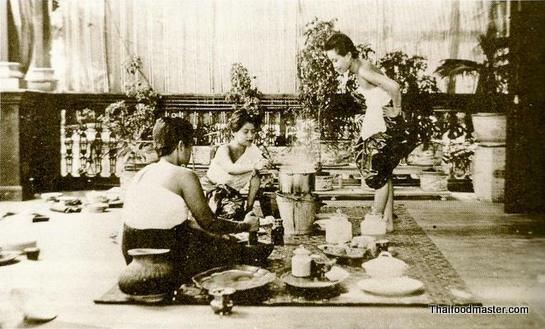 In fact, Thai ladies in the old days were expected to be capable of preparing khanohm beuuang crepe, and in time, it became part of a Royal ceremony ritual. 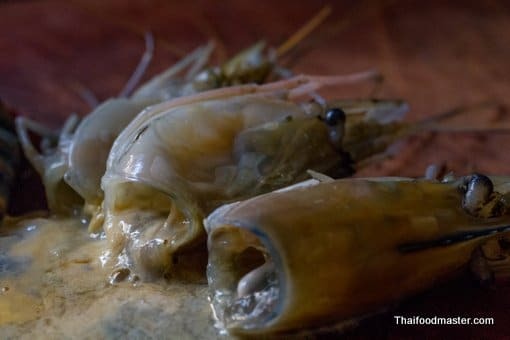 This ceremony was held at the Amarin Winitchai Throne Hall, the Royal Palace, during the traditionally abundant month of November when the shrimp are at their optimum weight and quality. It was called “The Royal Ceremony of Khanohm Beuuang” (การพระราชพิธีเลี้ยงขนมเบื้อง), and was part of “The Royal Ceremony of The Twelve Months” (พระราชพิธีสิบสองเดือน), a tradition begun during the early Rattanakosin era and only coming to a close during the reign of King Rama V.
During the reign of HM King Rama V (King Chulalongkorn the Great), the culinary arts in Thailand flourished, particularly as more foreigners – especially Westerners – came into contact with the country through trade. Many new products and techniques from outside Thailand were introduced, including new ingredients and raw materials such as liquors, wines, canned foods, wheat flour, cassava flour, dairy products, food additives, colorings and more. Upper-class families also began organizing receptions and dinners in the Western style. HM the King Chulalongkorn the Great himself was an aficionado and a skilled practitioner of the culinary arts. He enjoyed cooking and tasting, as well as reviewing and offering his insight on national and international dishes, and local and royal cuisines. 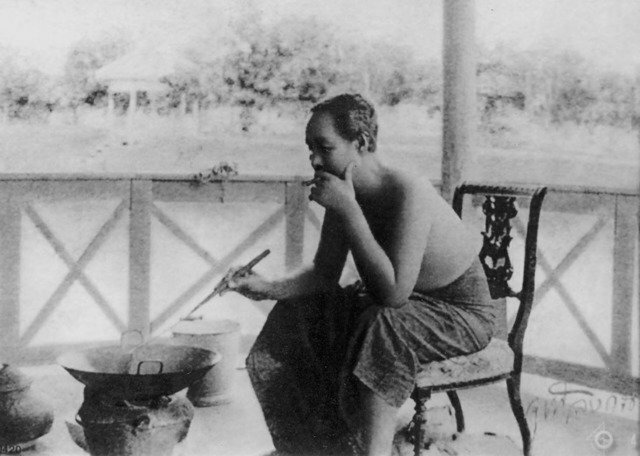 In his memoirs, he recorded the dishes he had seen and tried in his many royal visits abroad; the King’s commentary influenced Thai culinary culture, bringing new perspectives and recipes to an increasingly innovative and exciting culinary tradition. 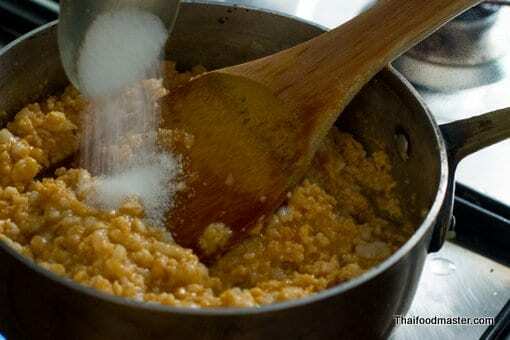 Khao mao beuuang (ข้าวเม่าเบื้อง) is one of these new recipes that originated during that period. It was adapted from the savory version of khanohm beuuang crepe. 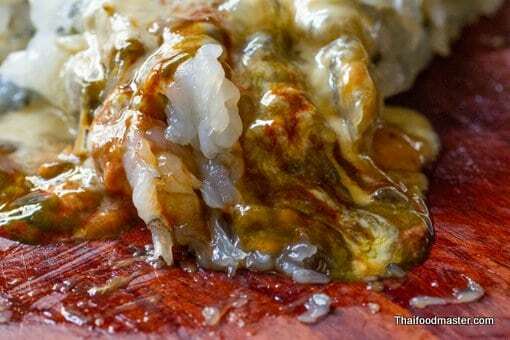 Instead of using batter for making a crepe, the savory toppings made from tiger prawns remained unchanged and were served alongside roasted crispy khao mao (pounded unripe rice grains). Chop the shrimp meat with the tomalley into small pieces. Fry the prepared shrimp in a pan and season with salt and sugar. 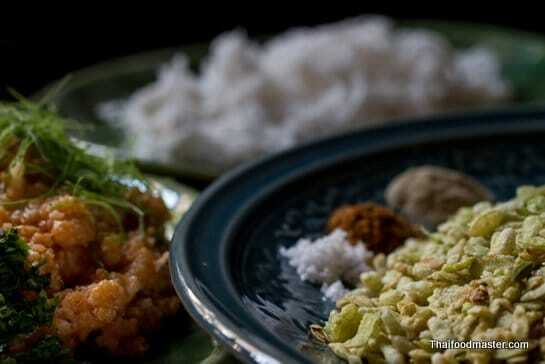 Put the mixture in a plate, and sprinkle it with finely-chopped kaffir lime leaves and coriander leaves. Shred the semi-matured coconut, and steam it for a short time, for longer usage, and put the coconut in a plate or a bowl. 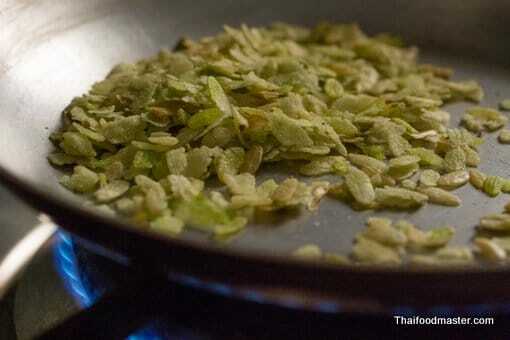 Roast the khao mao until it pops and is crispy, and put it on a plate; season with salt, ground chili and pepper. 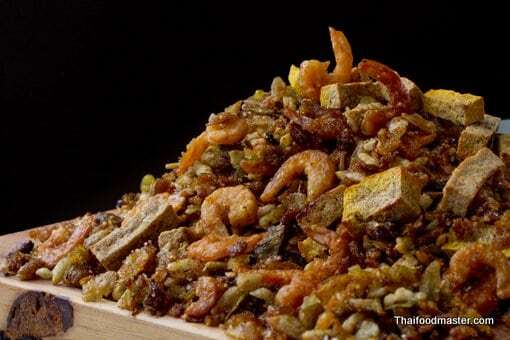 To serve, take a portion from each of the plates – the shrimp mixture, the coconut and the khao mao – and mix them well. Khao mao beuuang needs to be eaten immediately, when its crunchiness and flavor are at their height. Over low heat roast the Khao Mao in small batches. Rost the Khao Mao until it popped and become crispy. Set-aside. Peel the shrimp and save the shrimp tomalley. 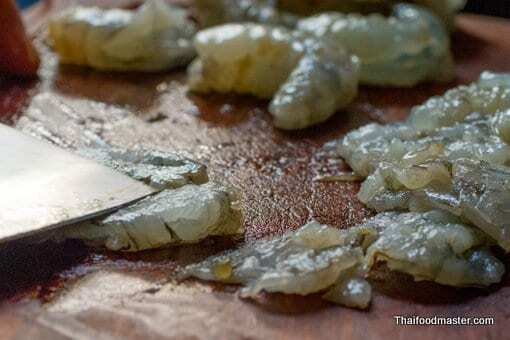 Smash the shrimp with a heavy knife, it will improve its texture. Mix the shrimp meat and the tomalley. Using a knife, mince the shrimp and tomalley mix to a fine texture (but not to a paste). 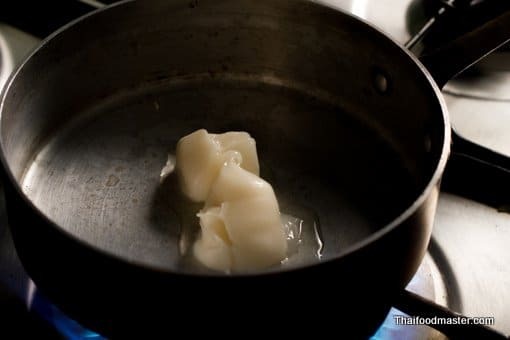 In a small cooking pan, place pork fat over low heat. Fry the mined shrimp meat. Fry the shrimp while constant stirring until cooked. Set aside. 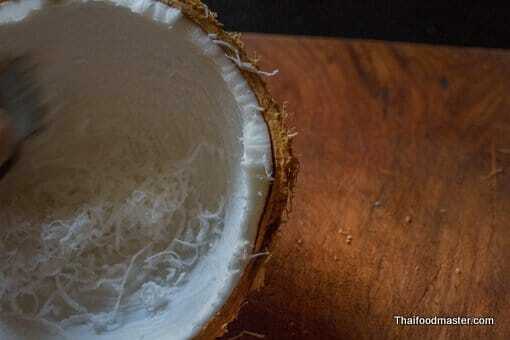 Grate the white flesh of the coconut using a Thai style greater. Set aside (Optional: steam it for few minutes with a pinch of salt.) Set aside. Cut the Kaffir lime leaves into fine chiffonade. 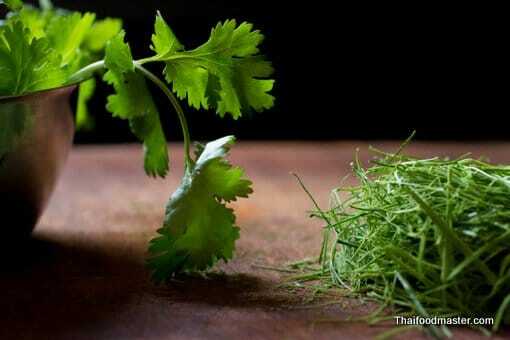 Hand torn the coriander leaves. Set aside. Arrange the dish in three plates. The fried shrimp relish top with kaffir lime and coriander leaves, the grated coconut and the roasted khao mao with side seasoning. Sweet Pounded Unripe Rice Flakes Cereal – Rice harvesting takes place only once a year, and there are only two weeks where the ripening grains are suitable for producing Khao Mao. Khao Mao doesn’t age well, it gets dry and tough quickly. The-once-vivid beautiful green color that portrayed the essence of its immaturity and the beginning of the rice harvesting season, slowly fades away, along with its bread like scent. Deceptively simple, the recipe for battered, deep-fried unripe rice and grated coconut banana rolls (khao mao thaawt, ข้าวเม่าทอด) is actually quite challenging to master. Like so many Thai dessert recipes, this seemingly straightforward dish has a complex character. This recipe would probably change your perception about the term “salad”, maybe because its dressing has a multi layered, curry-like personality, rather than the common sour vinaigrette-like dressing, or maybe because it takes some good few hours to prepare, somewhat longer than simply opening a bag of hydroponic greens. This salad is the fruit of the dedication of court ladies from aristocratic households, that for centuries perfected and elaborated on the art of cooking through detailed and calculated process, to create sophisticated dishes that are not only delicious but also very healthy and visually pleasing. These ladies made a very large commitment for small things, and they attended all their time and efforts to make minor things better and getting the small things just right.